Andy did a great job collecting the meeting minutes from our September 2009 meeting (also posted on the NING site). They are very detailed and informative, so I’ve brought them into the blog for future reference. September 22, 2009, 7:00 p.m.
Moustapha El-Hakam, president, calls meeting to order at 7:15 p.m.
01. (7:20 p.m.) Moustapha provided an update on the residence located on 2037 Norfolk Street. To date, the city has not been able to prove that the residence is a place of business. To that end, the City is to draft an affidavit for the property owner to acknowledge that the address is a deed restricted property and the activity that occurs on the property is not commercial. 02. (7:25 p.m.) Moustapha discussed the ornamental fence constructed around a residence on the 1800 block of Portsmouth Street. A fence is defined as a “structure” and must obey the minimum building line regulations (20 feet as it is defined on Portsmouth Street) set forth in the Deed Restrictions. The city has opened a file on the property and has apparently red flagged the structure. Multiple attempts to contact the owner have not been successful. A question was raised on how one may apply for a variance. It is the opinion of the Board that the Deed Restrictions remain intact. 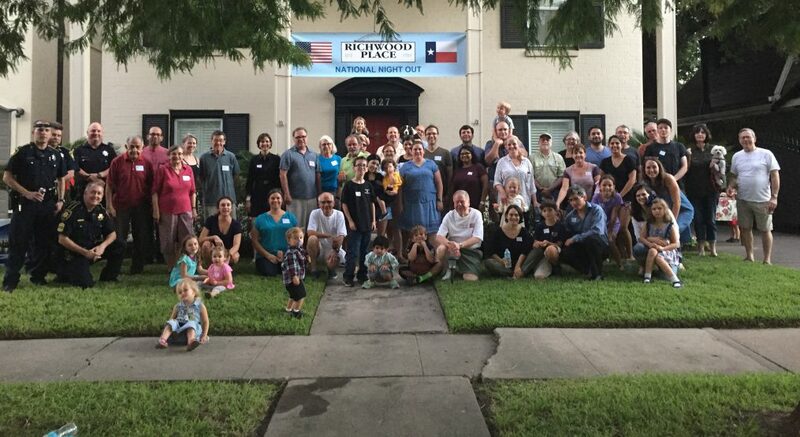 However, those neighbors who would like to learn more about the process are encouraged to contact the Houston Planning Commission (http://www.houstontx.gov/planning/) for information. The discussion was closed after some further clarification of the Deed Restrictions and some discussion on the topic of changing the Deed Restrictions. It is the opinion of the Board that the Deed Restrictions remain intact. The neighborhood is reminded that if you are in doubt or have questions as to the governance of the Deed Restrictions, please contact the President for clarification or discussion prior to starting any projects. 03. (7:40 p.m.) A request was to the board to provide a list of those properties which are Deed Restricted and a list of those blocks that have obtained Minimum Lot Size (MLS)/Minimum Building Line (MBL) designations. Moustapha indicated that a complete list of those residences with signed deed restrictions is not available and it is obligation of the individual buyer/owner to obtain that information. Any information obtained by the neighborhood association in the past is not considered to be 100% accurate and therefore non-publishable without the risk of providing false information. Those who have questions regarding deed restrictions, please call the Deed Restriction Hotline at 832.393.6333. Please note that this line is to the Office of the City Attorney’s Deed Restriction Enforcement Team and may not be able to provide information. Residents are also encouraged to find more information at http://www.houstontx.gov/legal/deed.html or by the contacting the city services help line at 311. The Board will try to give the Neighborhood an update on the progress of the MLS/MBL at the next general meeting. 04. (7:53 p.m.) Fairmont Museum District Apartments Update – no official news or updates were available at the meeting. A request was made by Moustapha to help support the payment of legal fees associated with past work and information will be posted on the neighborhood site with directions to make payment. Any little big helps! The Neighborhood Association is exploring the NING website as a social platform to share the neighborhoods interests. Based in Palo Alto, Calif., Ning offers an easy-to-use service that allows people to join and create networks. If you have not already visited the site please sign up today! City has been contacted about business with approximately 20 employees. Neighbors are encouraged to contact the city help line at if any disturbance by the amount of parking or noise is witnessed. Larry Wood gave an update on the upcoming Neighborhood Watch Training. Those who are interested are encouraged to come to the training on September 29, 2009 at 7:00 p.m at Larry Wood’s home (1823 Portsmouth Street). Treasury Report: As of September 28, 2009, RCPA had a total of $1834.35 in funds. Those neighbors who have not paid this year’s dues are encouraged to support your neighborhood! Discussion Item No. 04. – National Night Out – October 6, 2009!!!! Fire Trucks, Fun, and Food! We will once again hold the event in the middle of the 1800 Block of Norfolk! Contact Andy Stefaniak or Daniel Baker (on the NING site) for more information! Motion to Adjourn at 8:10 p.m. Number of neighbors attending: 30.